Rob’s interest in butchery and farming developed during his early childhood, which he spent helping on his grandfather’s smallholding and as a young boy bought a few sheep of his own to graze on his grandfather’s land. His interest in butchery materialized from the days he spent dressing poultry with his mother, who had won many NFYFC awards for Poultry Trussing. He is proud of his roots in Llanfihangel-y-Creuddyn and attended the village primary school and Penweddig Comprehensive School. On leaving school at the age of 16, Rob took a summer job at a local butchers shop, where he quickly got the taste of a regular and reliable weekly income. He remained there for the next 18 months, serving his apprenticeship and developing his skills and understanding of the trade. 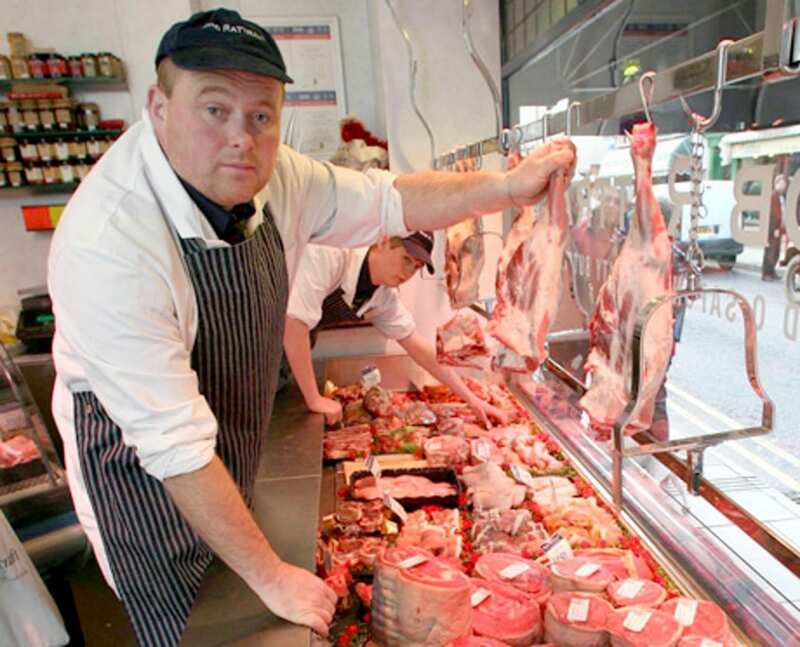 He then moved onto the local Bookers Cash and Carry store, where he became their youngest Butchery Manager at the age of 19 and stayed there for the next 9 years. In 1991, having gained considerable experience in the butchery trade, Rob ventured into business, purchasing a butchers shop in Aberystwyth town centre and hence Rob Rattray Butchers was established. In the early days, the business sustained just Rob, one full-time and one part-time member of staff. Incidentally, Paul Robotham, this original full-timer never left the business, and is now the Shop Manager. As trade increased over the years and reputation developed, the business gradually out-grew the shop premises in Chalybeate Street. It was evident that additional preparation area was required, so in 2003 a Meat Processing Unit was opened on the farm at New Cross. The Unit has proved an essential asset to the growth of the business; it is now the site where all meat and meat products are prepared, ready to be sold in the shop and to the catering trade. It allows the shop to concentrate on the retail trade, and focus on serving and helping the customer, which is of course the back-bone of the business. Over the years, the business has grown tremendously, thanks to the continued support and patronage of loyal customers. Rob Rattray Butchers sustains 6 full-time and 4 part-time members of staff, all trained to the highest standard to ensure meat is prepared and presented in the best way possible to serve the customer. During this period, Rob has also gradually developed and expanded his farming enterprise, but still considers himself a “Butcher-Farmer” who farms to supply his butchery business and subsequently supply the quality product that the market demands.